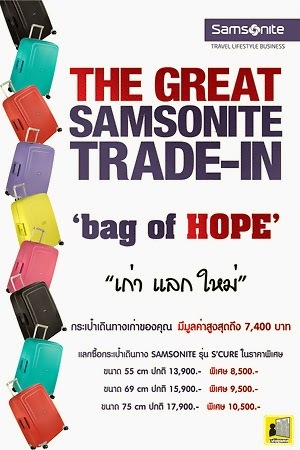 Bangkok – 24 February 2015 - Samsonite is bringing the successful “Samsonite Trade-in” campaign to its seventh year with “Bag of Hope” concept, providing another great opportunity for the public to jointly fill up the hope for those in need. By trading in their old luggage for a brand new Samsonite S’CURE, people can take part in extending help to the underprivileged through two major projects of The Mirror Foundation. Enjoy the spirits of giving with DIY items designed by a famous eco designer, and share impressive moments of "Give Bag, Give Hope" with renowned actor Louis Scott. 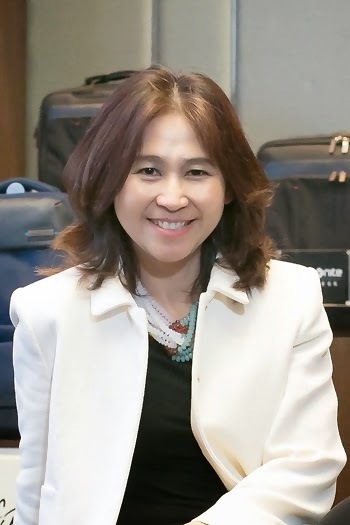 Ms. Lida Chessadatawornwong, Commercial Head of Samsonite (Thailand) Co., Ltd., the authorized importer and distributor of Samsonite, the world’s leading luggage brand for more than a century, said: “Samsonite leads the way in luggage innovation. With strong adherence to quality and service, we also ensure that the demands of our customers are completely met through our core values of 3Rs—Reduce, Reuse and Recycle—that spawned a continuing series of successful marketing activities and social campaigns. Starting with only a small idea to make return contribution to the Thai society, the concept has grown into a social commitment to help better lives of people. Among them is our “Samsonite Trade-in” campaign, which we are very proud of. It engages customers and the general public to contribute to the well-being of people who fall short of living necessities and comfort. Over the past six years, we have attracted a growing number of participants who trade in their bags. In 2014, we collected some 3,000 bags and donated them to The Mirror Foundation, where Bags of Hope can be fully utilized." The seventh annual campaign is being rolled out with “Bag of Hope” concept to gather and donate luggage that will fill up hope of needy people through two major projects of The Mirror Foundation, namely “Helping Patients at Home” and “Sick People on The Street” projects. The help this year will be extended to elevating the quality of life for the underprivileged through developing "sustainable giving" model. They can transform the luggage into other DIY items, and the activity can become a direct source of income for those who are interested. The knowledge will be passed on to The Mirror Foundation's volunteers, who will pass it on to officers at other partner charity organizations. 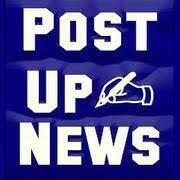 Then, the knowledge will be transferred to those in need or projects who are looking for a fundraising method. The campaign is honored by eco designer and design material expert Pattarapol Chantkam from Department of Industrial Design, School of Architecture and Design, King Mongkut's University of Technology Thonburi. The designer showcased his DIY creation using a used luggage to inspire others to make a living doing the same thing. The official launch of the “Samsonite Trade-in” campaign takes place today, with an objective to communicate with the brand's target audience about the background and goals of the campaign, as well as other detail about trading in the bag. The campaign has grown more special each year, with extended conditions for trading in, which now include luggage of any size, type, and brand, as long as it is still in a usable condition. 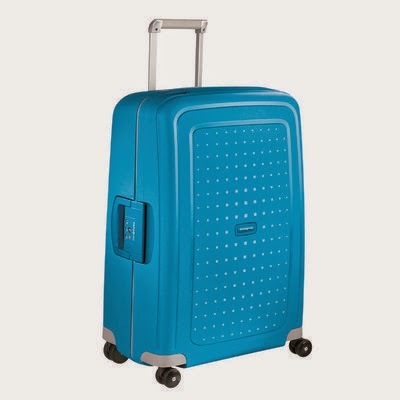 It can be traded in for popular Samsonite S’CURE luggage in three available sizes: 55 cm. Spinner at a special price of 8,500 baht from regular price tag of 13,900 baht, 69 cm. Spinner at a special price of 9,500 baht from regular price tag of 15,900 baht, and 75 cm. Spinner at a special price of 10,500 baht from regular price tag of 17,900 baht. Another highlight is that customers can share information about the campaign from www.samsonitetradeinth.com on their Facebook account to get special discount on top throughout the campaign. At the launching event, renowned actor Louis Scott shares impressive moments and his view on "Give Bag, Give Hope". 1. The donated bags will be filled with supplies and necessities and then given as a gift of hope to patients under care of our two major projects: Helping Patients at Home project that visits seniors patients and their family right at their hospital bed or home to give them mental support and provide medical supplies, senior diapers and household necessities to the patients and their family; and Sick People on The Street project that each year restores accessibility to healthcare to people who lost their way back home and have become homeless people and also coordinate to place them in homeless shelters or welfare homes. 2. The remainder of usable bags will be turned into DIY art. This year, this effort will be more tangible and effective. The bags can provide the underprivileged with a job and opportunities. The Mirror Foundation's volunteers and staff will learn DIY tips from DIY expert Pattarapol Chantkam, and pass on the knowledge to other officers or volunteers at other organizations who are The Mirror Foundation's partners. Those organizations will either pass the knowledge on to the underprivileged or make the creations for sale in order to generate sustainable income in the future. 3. The remainder of usable bags will be repaired or reconditioned and sold in our charity shops to raise fund in support of our projects." Pattarapol Chantkam, eco designer and lecturer at Department of Industrial Design, School of Architecture and Design, King Mongkut's University of Technology Thonburi, talked about DIY art as a sustainable source of income. "I am delighted that Samsonite realizes the importance of managing waste and utilizing it. It's the first time that I designed something from travel bags, and it was quite a challenge. 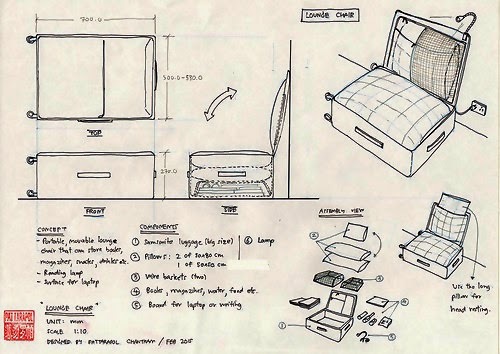 When designing these three prototypes, I thought about maximum functionality that each model of Samsonite suitcases could provide and using simple processes. I try to use the used and discarded products and materials that can be easily sourced. So the volunteers of The Mirror Foundation can further educate the underprivileged people, and hopefully they can make a living and generate income by studying these ideas and making products commercially in the future." One bag can create infinite happiness. Jointly pass on the happiness of giving and be part of the effort to fill the society with hope through Samsonite Trade-in from today until April 12, 2015 (limited availability) at 24 Samsonite Stores and 39 sales counters of Samsonite in leading department stores nationwide. For more information, contact 02-610-3200.